Well, no real problems from the 50mph winds. A few of the broad beans are bent over, but that’s no big thing. Most of my time has been spent on my ‘home’ plot. I noticed the pigeons were having gooseberries for breakfast, so the fruit netting came out at high speed. 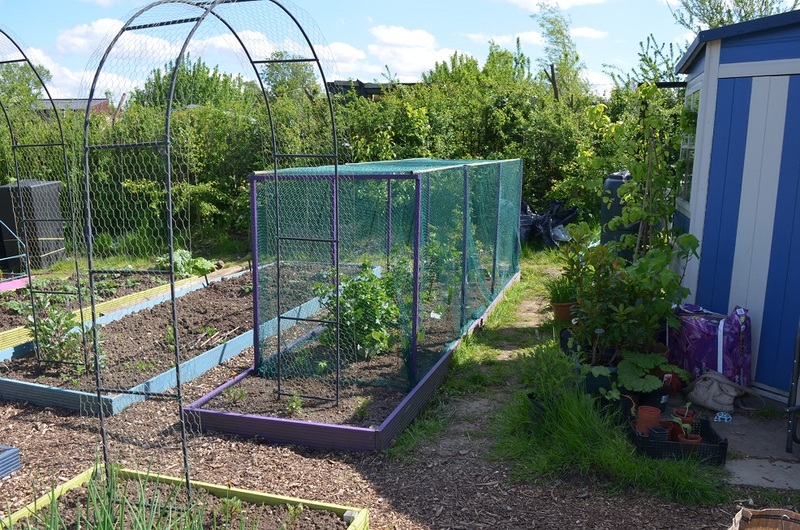 I now have a second fruit cage in a lovely shade of purple and a hoop construction down the bottom. The horsetail down there is positively rampant so I do think I will have to bareroot & move all the plants and only grow annual stuff there just to keep it under control. 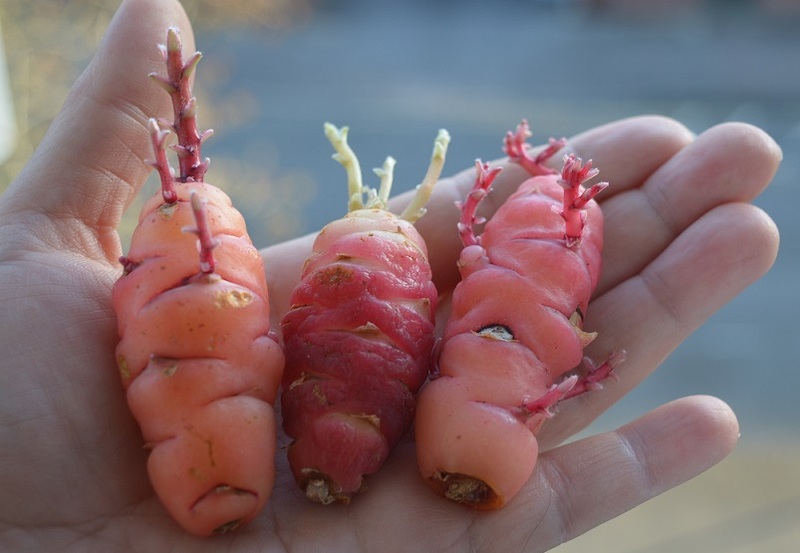 I put the oca into pots as the chits were beginning to sprout leaves – I have 5 pink & white and 5 peach, plus a few spare – I didn’t have any labels with me, so…peach ones are in the tray by the sweet peas. Also in are my second sowing of Kent Blues – 20 plants in a very short row. They have a protective fence of blackthorn trimmings to keep the birds off. A pair of magpies are nesting in the leylandii by the gate and it was very funny to watch one of them studiously tweak out most of my neighbour’s pea sticks and carry them off to their nest. Some of the 3-4ft sticks were way too big. Its return flight was distinctly wobbly. a bed of veg which needs watering was not one of my finest ideas! But planting wild garlic in the hedge seems to be working well. It’s flowering and smells very pungent. I put a potted Invicta in the sunny end of the new cage to keep it safe from pigeon attentions, but it was REALLY unhappy after just one day. It’s now back at the shady end, and I am surprised at how sensitive they are. The other one looks spindly and a bit desperate. On the other hand both Hinnomaki Reds are loving all the sunshine and are dripping with fruit. Weird. In figling news I’m left with 1 plant from 9 cuttings – but it does look very vigorous. I wonder how big it will get in a year. At the moment it’s still a 30cm twig with a leaf on the end. 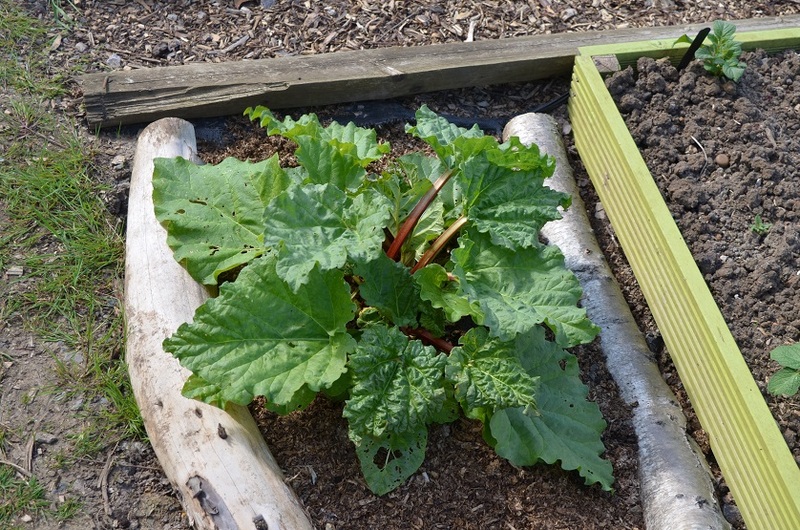 While I’m on fruit, Lazarus the rhubarb seems to be thriving and this year I definitely have apples, pears and possibly even a few quinces – I will be over the moon if I get all 3! I am obsessively checking the trees when I visit to make sure the fruit is still there…! Plot 92 has been largely ignored by me and worked loads by Andie, who’s put up a shed & bean frame in record time. I’ve put in 2 globe artichoke plants and thrown some water around in the greenhouse. The tomatilloes are already flowering and the tomatoes look like they are getting way too hot. I might need to sort out shading sooner rather than later. Swapped a Potimarron squash for a Gardener’s Delight tomato with a neighbour as I’m curious to see what they are like. At home I have sown 10 achocha, Cherokee Trail of Tears beans, Tromba di Albenga squash. I thought I’d lost the squash seeds – Piero found them under a sofa cushion while he was hoovering. Phew!